The 2016 Medical Technology Showcase is approaching with several collaborative partnerships coming together for the presentation booths as well as academic poster presentations being submitted for display. Visit the MedTech event page for live registration and a preliminary schedule. We encourage all CIBR members to consider registering and attending the Showcase to take full advantage of the opportunity to collaborate with other segments of CIBR membership. 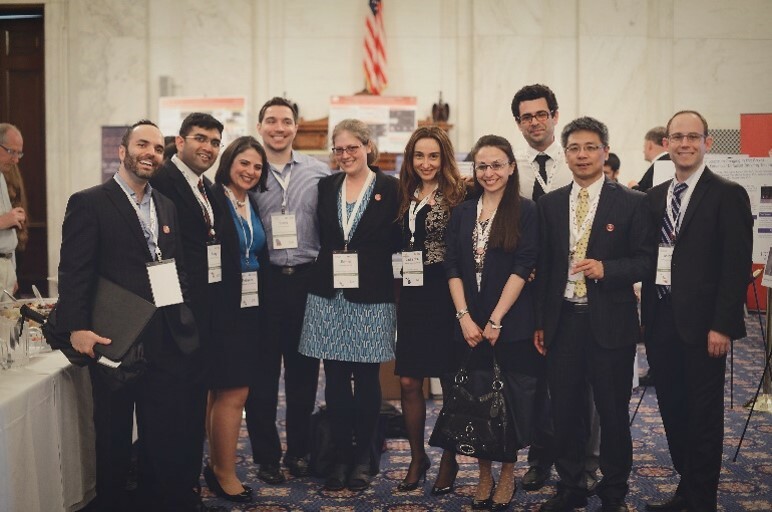 The Academy of Radiology Research is also proud to announce the 2016 recipients of stipends from the Academy of Radiology Research Academic Council (ARRAC) to travel to Washington DC and participate in the Showcase on Capitol Hill. The President’s Fiscal Year 2017 (FY17) budget was released on February 9, including a request for $82.8 billion in discretionary funding for the Department of Health and Human Services (HHS). Within this amount is $33.1 billion to the National Institutes of Health (NIH), nominally $1 billion more than was appropriated to the agency in FY16. However, a keen understanding between discretionary and mandatory funding is required to better understand how this amount is to be prioritized. The President’s budget requested $18.2 billion in total research project grants, which represents a net increase of 600 grants and $385.6 million over FY2016. However, it is worth noting that there is projected to be 628 fewer new grants in FY17. All of the increase is encompassed in noncompeting and SBIR/STTR grants. The President also requested $2.6 billion in funding for research centers, reflecting a decrease of $55.5 million from FY16. The President requested $641.3 million towards research careers, an increase of $9,049,000 over FY2016. Total research training increased by $18.2 million to $848.6 million for FY17. Mandatory & Discretionary Funding – What’s the Difference for 2017? As noted above, when considering both mandatory and discretionary funds, the President’s budget includes a $1.0 billion, or a 3.2% increase in funding for NIH. The quandary is that discretionary funding requires appropriation from Congress, while mandatory funds are permanently appropriated based on statutory language. Members of the Appropriations Committee in the House and Senate have many more and sometimes competing priorities to fund via the use of their jurisdiction over discretionary funds. What this means is that discretionary appropriations are just the tip of the iceberg and still require a great deal of energy, effort, and advocacy to ensure the most positive outcome for NIH funding which has traditionally almost entirely comprised of discretionary appropriations. Conversely, programs such as Medicare and Social Security are mandatory by law. The President’s budget designates the $680 million coming to NIH for the Cancer Moonshot as mandatory. It also creates a new line for “Other Mandatory Financing” at $1.15 billion. This total of $1.8 billion in mandatory funding for the NIH suggests that the available funding is really $31.3 billion, not $33.1 billion. The Academy and CIBR will be very involved in the challenge to advocate for the most positive outcome for a real, bottom line funding increase for imaging – and all – biomedical research. Now to assess the NIBIB budget request more specifically, in his FY2017 budget, the President requests funding for NIBIB at $343.5 million. However $9.5 million of this falls into the “Other Mandatory Financing” category discussed above. As stated in the President’s budget based on the assumption that the mandatory funding materializes, the budget includes $219.2 million in Research Project Grants; status quo on Research Center funding at $47.2 million and on Training Grants at $10.2 million. Research and Development Contracts increase from $18.3 million to $26.5 million. There are no funds identified in the budget designated as coming from the President’s mandatory cancer moonshot funding. The President’s budget starts to bring some clarity to the Vice President’s initiative that has become known as the “Cancer Moonshot.” The budget includes approximately $1.0 billion to support this effort. Within this amount there is $755 million in mandatory funds in FY2017 “to accelerate progress in preventing, diagnosing, and treating cancer.” This includes $680 million to NIH and $75 million to the Food and Drug Administration (FDA) for “research and infrastructure,” including efforts to bring researchers across disciplines together to accelerate research and treatment. The President’s request indicates that $195 million towards new cancer initiatives at NIH during the current fiscal year (FY16). It is not entirely clear where these funds will be allocated from and the Academy will continue to monitor developments to clarify these allocations. The Academy will continue working on the development of a cancer centric imaging agenda and will continue consistent communication on our progress. With the release of the President’s budget begins a process to prioritize and advocate for funding of programs and initiatives that will have the most positive impact on enhancing patient care through advances in biomedical imaging. The National Institutes of Health (NIH) has received a long overdue 2 billion increase in funding, and as we begin to focus on FY17 appropriations, it is important that the imaging community continue to advocate ensuring that the FY16 increase for NIH is the first step in a consistent commitment to capitalize on innovative scientific opportunity. The NIBIB received a portion of the $2 billion increase in NIH’s appropriated funding in FY16 under the FY16 omnibus reconciliation bill. In total dollars, NIBIB’s budget in FY16 is $343.5 million, up from the FY15 budget amount of $327.2 million. In addition to this increase, NIBIB is receiving $3.6 million for the President’s BRAIN initiative. Read more about the NIBIB budget, advocacy, and see a profile of NIBIB Director Roderic I. Pettigrew PhD., MD.